Despite a marathon meeting of the state election committee of the BJP at Delhi yesterday, senior leaders have been able to forge consensus over single name from only about 12 seats while there was a difference of opinion over fielding sitting MLA Rajiv Bindal from Solan. With BJP bigwigs throwing their weight behind state BJP’s two rival contenders - national vice-president Shanta Kumar and Hamirpur Lok Sabha MP Prem Kumar Dhumal - for the post of the next Chief Minister of the state, former Prime Minister Atal Bihari Vajpayee will have the last word on the issue in case the BJP returns to power in the state, say party sources. Deep-rooted factionalism coupled with the elephant (BSP) waiting to give a free ride to rebels seems to have upset the Congress plans to effect a wholesale change of sitting legislators to counter the anti-incumbency factor. Chief Minister Virbhadra Singh said addressing a press conference at Renuka today that as the BJP was a house divided, it had so far failed to declare its candidate for the post of Chief Minister. The BSP will bring about a constitutional amendment to change the transfer policy in Himachal Pradesh, Major Vijay Singh Mankotia, convener of the state BSP, stated addressing a rally at Dhalpur Maidan today. Peter Ronald deSouza has been appointed director of the Indian Institute of Advanced Study which has been without a head for the past 19 months. The green cover in this picturesque town is under threat, especially in the municipal limits and adjoining panchayat areas, where there is no check on the felling of trees. The town is losing its greenery at a fast pace and concrete jungles are coming up. The Forest Department and the local authorities seem unconcerned to the situation. With the Kasauli-based Central Research Institute (CRI) failing to upgrade its laboratory as per WHO-approved good manufacturing practices (GMP) norms, the Ministry of Health and Family Welfare has suspended manufacture of Japanese encephalitis vaccine here. Despite being the lone institute in the country manufacturing JE vaccine and supplying it to at least nine states, the ministry did not hesitate to take the extreme step. The two-day second annual state-level conference of the Indian Medical Association (IMA) on‘continue medical education’ concluded at Paonta Sahib on Monday. Prime Minister of Tibetan government-in-exile Samdhong Rinpoche yesterday released a book “Lahasa Pukare Kailash Ko”, which is a compilation of articles and essays by the Sangh leaders and academics concerning the Tibetan cause. Two workers died in separate incidents in the Baddi-Barotiwala-Nalagarh industrial area today. Ram Narayan, 55, killed after he fell from the second floor of the building of Birla Textile Mill at Sai Road in Baddi, around 10 km from here. The 16 employees from the Horticulture, Health, Civil Supplies and Irrigation Departments who went scot-free for their pro-Congress role in the Hamirpur Lok Sabha byelection despite directives of the Election Commission could once again be in trouble. With a view to disciplining the erring politicians who have failed to deposit dues in lieu of various facilities availed of by them, the Election Commission of India has introduced a new format requiring NOCs from five departments. The format would have to be filed along with the nomination papers. Kesh Pathania, a former president of district NGOs and the HP Draughtsman Association, joined the BSP at a workers’ conference organised by state unit general secretary Krishan Kumar Kaushal at Tobba, about 80 km from here, yesterday. The BSP here has condemned a government notification under which 90 ayurveda doctors, who were appointed under a contract system several years ago, have been asked to return Rs 60,000 to the government each and also to accept recovery of Rs 7,000 from their salary every month for overpayment made to them till now. The BJP faces an uphill task in the reserved Kasauli constituency with more than 17 contenders vying for the party ticket. Though the constituency is considered a strong bastion of the Congress, its sitting MLA Raghu Raj faces the ire of voters due to his alleged indifference towards development projects. The issue of dual voters came into the limelight when the BJP objected to thousands of such voters who had played spoilsport in the recent Municipal Corporation elections of Shimla. It was found that thousands of people, especially from Shimla, were working in Solan, Sirmaur, other nearby districts as well as proper Shimla. As many as 5,360 presiding and polling officials, who have to conduct polling at 1,275 polling station in the 16 constituencies of this district on December 19, are being imparted training in the first phase that will conclude tomorrow. President of the Ex-Servicemen Welfare Action Committee Brij Lal Dhiman has decided to contest the Assembly election from the Hamirpur constituency as an Independent candidate. The top brass of the state BJP spent almost 10 hours, shortlisting 576 applications who have applied for the party ticket from 65 assembly segments. The list of aspirants has now been pruned to over 150. The state election committee is likely to finalise the list tomorrow. The final list will be placed before the central election committee of the party, which will meet at 5 p.m tomorrow. All senior leaders, including L.K. Advani, Rajnath Singh, Atal Bihari Vajpayee, Sushma Swaraj, Arun Jaitley are members of the central election committee, which will be the final authority in ticket allotment. A majority of the sitting 17 MLAs of the BJP are likely to be fielded but the party is having second thoughts about giving the ticket to Bindal, whose name has figured in questionable land deals in Solan district. A section of the leadership was of the view that since the BJP was planning to make corruption the main election plank the party should not field candidates whose credibility was questionable. 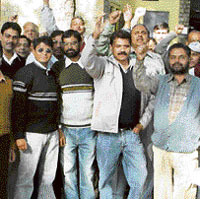 All senior leaders, including Shanta Kumar, P.K. Dhumal, Jai Ram Thakur, Suresh Bhardwaj, Mohinder Pandey, Maheshwar Singh, J.P. Nadda and Mr Radha Raman Shastri attended the central election committee meeting. There was no debate on the the candidates from Palampur and Bamsan, which are the assembly segments of Shanta Kumar and P.K. Dhumal. With senior leaders being engaged in the process of shortlisting the long list of ticket aspirants, there are two to three names from all the constituencies barring a 12-odd seats. There are some assembly segments like Shimla, Solan, Kullu and Banjar and a few others where the final decision is likely to be taken by the central election committee. The names of Suresh Bhardwaj and Khushi Ram Balnatah are being considered from Shimla. In the case of Kullu district, with both brothers Maheshwar Singh and Karan Singh seeking the ticket from Kullu and Banjar, there is a possibility of adjusting only one of them. Gujarat Chief Minister Narinder Modi, BJP chief Rajnath Singh and former BJP president Venkaiah Naidu are learnt to thrown their weight behind Dhumal. On the other hand, Sushma Swaraj, Murli Manohar Joshi and other hardliners are supporting Shanta Kumar, sources say. However, Vajpayee will have the final say on the issue, sources in the Sangh Parivar say. It was Vajpayee who had asked reluctant Dhumal to contest the Lok Sabha election last year. Those supporting Dhumal say he won the Hamirpur election by over 80,000 votes, bailing out the BJP from the “crisis of confidence”. Dhumal’s regime in 1998-2003 managed to restore confidence of the apple growers, who were “antagonised during the Shanta regime in 1992”. Those throwing their weight behind Shanta Kumar claimed the BJP won in 15 segments out of 17 in Hamirpur just because Shanta had campaigned in four districts. The BJP lost battle of the ballot to the Congress as the Dhumal regime remained embroiled in S.M. Kotwal corruption case. They say the party should field Shanta Kumar from Palampur as it will benefit the party in 18 constituencies in the Kangra belt. Citing the Yuva Garjna rally held here on Sunday, which was addressed by Rajnath Singh Satya Pal Jain, Shanta Kumar and Dhumal, during which Shanta got a loud applause from the public, as a proof of support for the latter, Shanta’s supporters said the party must consider “people’s pulse” while deciding the leadership issue. Jai Ram Thakur said the leadership issue and whether both leaders should contest elections or not have been left to the high command for deciding in its meeting in New Delhi on November 22 or 23. The ticket allotment will also be finalized in the meeting, he added. The bargaining among Shanta and Dhumal supporters has assumed a hot political significance as both leaders have reached New Delhi for the crucial central election committee (CEC) meeting to be held tomorrow or a day after. The committee will not only finalize tickets, but also get feedback from party leaders, sources say. The ongoing exercise to allot the ticket has been a tight-rope walk and indications are the party may be forced to retain most of the sitting legislators. The axe is likely to be fall on those who unsuccessfully contested the last assembly elections. The screening committee of the AICC which held a series of meetings over the past two days has after an elaborate exercise cleared the names of most of the sitting legislators. The only exceptions are civil supplies minister Singhi Ram whose name has been bracketed with Nand Lal and housing minister Harsh Mahajan who had declined to contest for personal reasons. The cases of four of the five associate members who successfully contested the last elections against the official party candidates will be decided by the central election committee which will hold its meeting on November 23. Only the name of Kuldeep Pathania, who was the only applicant from Bhatiyat, has been cleared. The contentious issue whether or not the relatives of senior party leaders be allowed to contest will be referred to Congress President Sonia Gandhi. While revenue minister Sat Mahajan is keen to opt out of the fray to make way for his son, Ajay, from Nurpur, PCC Chief Viplove Thakur wants her brother, Manu Sharma, to contest from Jaswan. Similarly, former minister Chander Kumar wants the ticket for his son Neeraj Bharti from the Guler segment. However, the candidature of Anil Sharma, a son of former telecom minister Sukh Ram, has been cleared from Mandi. The screening committee went through the data of past three elections and after taking factors like repeated defeats and margin of defeat decided to change some of the candidates who lost the last assembly poll. Accordingly, the candidates from Solan, Paonta, Rajgir, Nadaunta, Dharampur, Banzar and Chopal could be changed. He said the Congress would seek votes on development carried out during its tenure while the BJP campaign was based on ‘false allegations’. The Chief Minister said the BSP had no base in the state and its UP formula had failed to make any impact on the people of Himachal Pradesh. The Chief Minister, who looked unhappy with the EC decision to force early elections in the state, said the Congress would return to power with at least 50 seats. He disclosed that all five associate MLAs would get the party ticket on merit like Congress MLAs. He dismissed the comments of the state Congress President for not granting the party ticket to the associate MLAs as her personal view, and not that of the Congress. The CM hoped that the candidates would be announced within two days. He made it clear that the decision of the high command would be binding on all party workers. Virbhadra Singh said that UPA president Sonia Gandhi, Congress general secretary Rahul Gandhi and Prime Minister Manmohan Singh would be among the star campaigners for the party. The party would give preference to door-to-door campaign to reach every voter. Haunted by the jinx of famous belief of the people of Sirmaur that if any Chief Minister or Governor missed the Renuka fair, he also missed his chair before the next fair, Chief Minister Virbhadra Singh today made it a point to attend the fair. The Chief Minister, who was busy in Delhi due to the on-going ticket distribution process, could not attend the inaugural ceremony of the fair yesterday. He arrived here direct from Delhi and proceeded to Renuka Ji to pay obeisance to Lord Parshuram and goddess Renuka. The BSP will bring about a constitutional amendment to change the transfer policy in Himachal Pradesh, Major Vijay Singh Mankotia, convener of the state BSP, stated addressing a rally at Dhalpur Maidan today. “As many as 15 lakh of the 35 lakh population of the state were unemployed. We have framed a programme vide which employment generation would eradicate unemployment from Himachal Pradesh,” added Mankotia. Criticising the Congress, Mankotia said the present state government was corrupt as was evident from the CD episode. Showing the CD to the audience Mankotia said Virbhadra Singh could not file an affidavit in the High Court saying that the voice in the CD was not his. Mankotia said he had filed an application in the High Court praying that Virbhadra Singh should file an affidavit denying the contents in the CD. Mankotia said the BJP had been dodging people in the name of ‘Ram’ and had collected Rs 700 crore for constructing a ‘Ram temple at Ayodhya” but no construction had so far been done. BSP general secretary Man Singh Manhera declared that half of the BSP candidates in Himachal Pradesh would be from the youth wing of the party. The post had been vacant since April 15, 2006, when the last incumbent, Bhuvan Chandel, completed her three-year term. The search committee had earlier selected Amitabh Kundu of Jawahar Lal University but he declined to take up the assignment. A visiting senior fellow at the Centre for Study of Developing Societies, Delhi, deSouza has been the co-director of the Lokniti programme and was currently coordinating the State of Democracy in South Asia (SDSA) project. He is also chairperson of the Goa Knowledge Commission. He remained a member of the International Political Science Association's Research Committees on political philosophy and political sociology and the University Grants Commission's expert panel in political science from 1997 to 2000. He was awarded the British Council Visitorship to the U.K. where he made presentations at Warwick and Sussex Universities in 1992. He was a visiting professor at Birkbeck College, London University, and a visiting scholar at the Taubman Centre, Kennedy School of Government, Harvard University. He has several books and research articles to his credit. The number of deodar trees is declining fast. 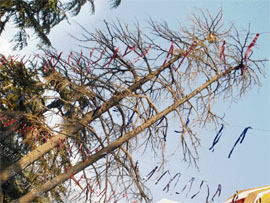 Over 100 deodar trees have been either axed or dried up in the town over the past 10 years. Over 12 trees have dried up in front of the local PWD Rest House. No efforts have been made by the authorities to know the reason behind it, neither any new trees have been planted. Van Mahotsava is celebrated in the town every year and VVIPs are called to plant saplings, but soon most of these saplings disappear. Over the past few years, various government departments have taken forest laws lightly and number of precious deodar trees have either been cut or lopped off without valid permission from the authorities concerned. Many government buildings have come up in various areas by cutting trees. Recently, many old trees were axed in the town to pave way for new buildings. Nobody in the administration knows who granted the permission to cut these trees. There are many other instances where deodars have been axed without any permission. Rules say that the department concerned or the municipal council should seek prior permission for felling trees from the Forest Department, which is ultimately granted by the Deputy Commissioner who is also the District Magistrate. However, many government departments undertake axing of trees bypassing rules and regulations. Meanwhile, voluntary organisations and environmentalists have lodged protest with the authorities concerned over the reckless felling of deodar trees. However, the Forest Department says the municipal council is the only competent authority to initiate action against the defaulters when such an act takes place in municipal limits. A deodar tree takes 70 years for full growth. Though the institute has invested Rs 14 crore in upgrading its laboratory as required under the WHO norms, it failed to maintain the GMP norms. The state drug authorities, which conducted an inspection, declared that the laboratory did not adhere to the GMP norms following which the ministry suspended manufacture of the vaccine. The direction has come as a shock to the institute staff where at least 70 staffers have been rendered workless. Not only are they being paid wages for the past around 18 months without any work, but the unfinished and pipeline vaccines have led to losses worth crores. Since the orders were abrupt, it gave little time to suspend related activities. Sources said, “In the absence of any directions, the production house kept producing mice (required for production of vaccine) for almost a month after the vaccine manufacture was suspended. It was only when 10,000 mice were produced and there was no space to house them that their breeding was suspended. That, too, after the staff brought this to the notice of senior officials. Not only had the stock of 10,000 mice to be killed, but each mice that cost Rs 30 led to an avoidable wastage of several lakhs. Interestingly, when the director general of Health Services visited the institute in May this year, he had announced that the vaccine would be manufactured with a new technique in the near future as the present “mice brain technique” had lost vitality. Still interesting, the ministry has launched a universal immunization programme wherein it is undertaking vaccination of children against JE in nine states in a phased manner. While the government is importing cheaper Chinese vaccine for the programme, the suspension of manufacturing in its own country is being considered a thoroughly retrograde step. As per figures presented in Parliament, the ministry imported 135 lakh doses of JE vaccines worth Rs 12.83 crore from China in 2006. The ministry has been putting forth the plea that the Chinese vaccine was priced at Rs 9.50 per dose, while the CRI vaccine was priced at much higher rates. The CRI director was not available for comments. However senior scientist said since the efficacy of the Chinese vaccine was not clinically tested in India, its use was not a very favourable step. The conference was organised by the IMA, Himachal Pradesh. Over 250 medico delegates, including renowned surgeons and physicians from all over the state, Uttarankhand and Yamuna Nagar district of Haryana, participated in the function. Chief Justice of the Himachal Pradesh high Court V. K. Gupta, who was the chief guest for the inaugural ceremony, called upon the medical professionals to serve society in a better way and avoid legal complications. The general secretary of the all-India IMA highlighted the main difficulties faced by medical professionals in the country while Dr Upender Kumar, state IMA president, and secretary Atual Mahajan underlined the challenges before the medical fraternity Several other distinguished delegates also spoke. Edited by former HP Chief Minister Prem Kumar Dhumal, the book was released at a function in the Constitution Club. The 109-page book, brought out by the Bharat-Tibet Sahyog Manch, contains articles on the need of resolving the Tibetan issue and provides viewpoints of some senior Sangh functionaries. Apart from some letters on the subject, it also has media reports about the meeting of the national council of the manch held at Dharamsala last year. Two workers died in separate incidents in the Baddi-Barotiwala-Nalagarh industrial area today. Ram Narayan, 55, killed after he fell from the second floor of the building of Birla Textile Mill at Sai Road in Baddi, around 10 km from here. The mishap occurred while he was carrying out some repairs in the building. He was rushed to the ESI Hospital where he was declared “brought dead”. He was transferred here from Delhi recently. The body would be handed over to his relatives after a post-mortem examination. The Election Commission has issued fresh directives that the heads of departments concerned may be asked to initiate proceedings against these officials for campaigning in favour of the ruling party candidate during the Hamirpur byelection. Most of these employees were posted in Una district, which falls under the Hamirpur Lok Sabha seat. Complaints about the objectionable conduct of these 16 employees were sent to the Election Commission after the Hamirpur byelection. After an inquiry the commission had found that these people despite being in government service had campaigned for the Congress. Despite these orders the heads of departments concerned have still not taken appropriate action against them. However, the commission has now issued fresh orders that action be taken against them so that there is compliance of the previous orders. The commission has also directed that the conduct of these 16 employees should be closely monitored during the assembly poll. As such it is not only these 16 employees could face action but others could also be in trouble in case they campaign for any political party. The BJP has pointed out that some government employees, including senior officers, are actively campaigning for the ruling party. NOCs would have to be sought for government accommodation, supply of water, telephone, other facilities, including use of government transport. These NOCs will be in addition to the existing ones required to be furnished by the candidates. If there is more than one constituency in a district, the district election officer has been directed to publish this information in a consolidated form constituency-wise and ensure compliance. The commission has also issued direction to bring these directions to the notice of political parties. The new system would help tighten the noose around the neck of wilful defaulters who purposely desisted from paying dues for use of various facilities provided by the government. Krishan Kumar Kaushal told mediapersons here today that Kesh Pathania, who earlier resigned from his government service, had been entrusted the task of mobilising employees in favour of the BSP in 22 assembly segments of the state. Kaushal said Congress leader of Kotkehloor Surendra Kumari, a former president gram panchayat of Reeh, had joined the BSP along with hundreds of her supporters. Other Congress leaders who joined the BSP at Tobba were Nanak Dev, Devi Ram, Indru Ram, Amar Chand Thakur and Rattan Lal Kaundal. Among the BJP leaders who had joined the BSP were Jeet Singh Chandel, former BDC member Satpal Sharma, Hari Ram, Raj Kumar, Sada Ram, Rattan Singh Chaudhary, Amar Chand Chaudhary, Omkar, Jagtar Singh, Tejpal Teju, Subhash, Jagat Ram Chaudhary, Guljar Thakur, Dr. Parkash Chand, Master Kamal lal and Khemraj. State BSP secretary and former zila parishad chairman Dilaram Dhiman demanded that the government should immediately withdraw this order and stop any recovery from these doctors and if there had been any technical mistake in the department, then it should be settled in the office and these doctors should not be punished now for mistakes of others after several years of service. Dhiman warned that if the process of recovery was not stopped immediately, then he would be forced to start an indefinite hunger strike as a protest against this injustice. He claimed that this government was now on the way out after the elections on December 19 and it had no right, whatsoever, to issue such recovery orders. Dhiman said that if the BSP came to power in state after the election, it would not only withdraw this dictatorial order but would also ensure that all 90 ayurveda doctors are regularised in service. Selecting a suitable candidate for the seat will be tough for the BJP as many new faces like Rajiv Sehjal, Bharat Bhushan (a former IAS officer) and many others are making efforts to get the ticket. Among the old-timers, Virender Kashyap (a former chairman of the HP Marketing Board), Satpal Kamboj (a former MLA), Chamal Lal Gachli, Parminder (a BDC member) etc., appear to be the front-runners for the ticket. The constituency faces a typical situation as there seems to be no consensus on any single name. Virender Kashyap, who is again staking claim for the party, has lost a number of times. Even last time, it was the divided house of the BJP that had led to his defeat. He, however, stands tall among the other aspirants. As far as the new names are concerned, senior BJP leaders of the constituency say they will not accept being parachute entries at any cost. On the other hand, the new entrants are relying on support from the senior leadership and they are hopeful of winning over the seniors who are vying for the ticket. Interestingly, state party affairs in charge Satya Pal Jain opined the foremost criterion was the acceptance among the masses and the cadres. A cumulative effect of other factors like winnability, clean image, vision towards the state as well as commitment towards the party would finally decide the ticket. He said it did not matter whether the candidate was a senior leader or had recently joined the party, if he had the ability to win the seat he could be granted the ticket. Silencing those critical of new faces, he said there was always a first time and every promising person should be granted an opportunity. Negating any scope of factionalism leading to the defeat as had happened earlier, Jain said all contentions existed till the ticket was decided but once a candidate was finalised, the entire party would support him. The issue of dual voters came into the limelight when the BJP objected to thousands of such voters who had played spoilsport in the recent Municipal Corporation elections of Shimla. It was found that thousands of people, especially from Shimla, were working in Solan, Sirmaur, other nearby districts as well as proper Shimla. While they continued to be enlisted as voters in their respective villages they had also sought registration as voters in the districts where they served. As per section 17 of the Representation of the People Act, 1950, no person shall be registered as an elector for more than one assembly constituency. Further as per section 18 of this Act no person shall be entitled to be registered as an elector for any assembly constituency more than once. An elector shall be entitled to be registered only in the assembly constituency where he ordinarily resides. Information procured from the district administration here revealed that as many as 4897, 2688, 2995, 2649 and 4121 dual registrations had been detected in the five constituencies of Arki, Doon, Nalagarh, Kasauli and Solan, respectively. While 1005 electors have been found fit for deletion from the electoral rolls of Arki, 45 and 42 such entries would be deleted from Doon and Nalagarh, respectively. Additional deputy Commissioner K.D. Lakhanpal said here this evening that 182 polling stations in the district were hypersensitive and 284 sensitive. He said adequate police force had been arranged to man hypersensitive and sensitive polling stations. The second phase of the training would be held from December 6. No woman official had been put on poll duty this year and the polling and presiding officers had not been deputed in their home and official duty constituencies. He said the last phase of the training would end on December 16. He said he had appealed to youths, women and ex-servicemen to support him as the BJP and the Congress had failed to protect their interests.